Placing a Candy Display near the checkouts is a profitable way to increase impulse buying and your sales. 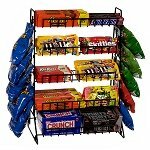 Adding this portable candy merchandiser will stop some of those dollars from going right out the door with the customer. This attractive portable display rack also add the convenience of being transportable so if you want to shake it up from time to time move this beautiful display, you can with ease. This retail display comes with five shelves but you can have up to seven if you choose. Adjust your wire racks to sit flat, slightly slanted or have them with a deep slant. The positive attributes from having them flat is you can host more products while slanted gives better accessibility for your customers. 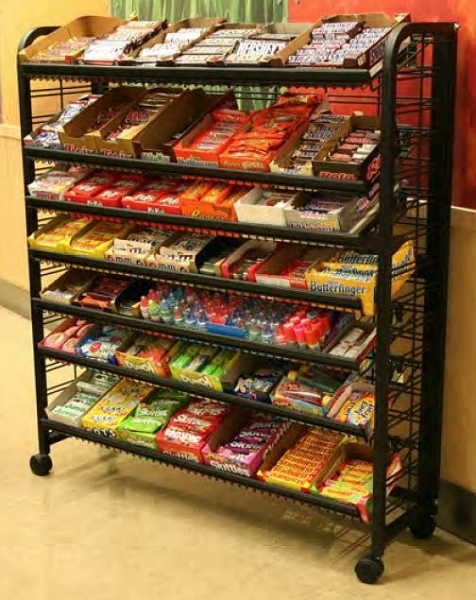 Increase your candy sales by ordering your premium rack today! Optional Shelf Size is 44" x 12"